I arrived at New England Bay at 9.50am and was surprised to find none of the walkers there. At 10am I knew that something was wrong and phoned Irene who said they were all waiting for me at Ardwell, which was what was in the local paper (and, as I found out later, it was on our programme – sorry for keeping you all waiting!). I and then discussed a change of walk with Irene and Elaine who had organised our having lunch in the Logan Botanic Garden – thank you both and for putting up with my bad mood at the beginning of the walk. Not wanting to arrive at the garden too early I was suggesting a longer walk and we set off northwards on a really lovely day. Debbie was there with a friend of hers from Zimbabwe. Duncan, Jack, Florence, Jim, Christine (PP caravan), Carl, Isobel, Mary Sloan, Ken, Audrey and Christine Sloan were also there. 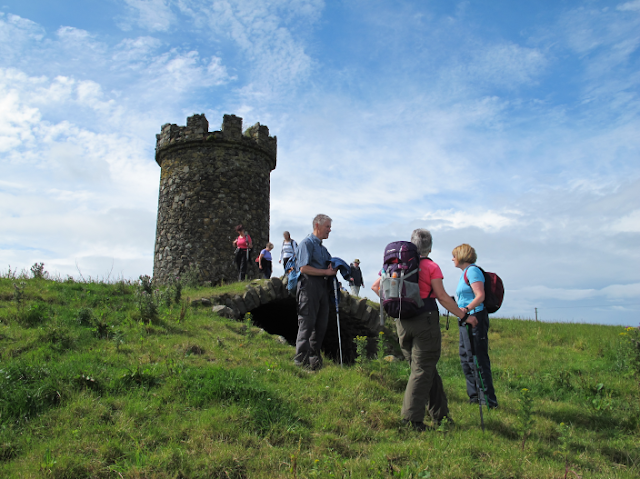 A sunny morning saw fifteen ramblers gathered at the walk start at the Chapel Rossan Bay car park. The weather forecast was for heavy showers but the group were cheerfully optimistic they'd avoid some of them. A short road walk south on the main Drummore road brought them to the track opposite Auchness. Auchness Castle is a 16th Century Tower house. Three storeys high, it was a MacDouall family stronghold. Still occupied, it was converted into a farmhouse in the 19th century. A fresh coat of whitewash made it a picturesque view in the sunshine. From here a track took them down to Killingeane. Here they could see the renovation of a one-time church. Built in the 19th century, dedicated to St Agnes, it was originally an Episcopal chapel to Logan House. Growing profusely along the roadside was Himalayan Balsam. Beautiful flowers but an invasive species as prolific as Japanese Knotweed. The track westward took them now to Logan Mills on Luce Bay. A custom built small creature and bug palace was admired. Made from air bricks, small ceramic pipes and wooden pallets, it looked a work of art. A short detour was taken for a closer view of Logan Windmill. Built in the late 17th century and used for grinding corn it's in amazingly good condition considering it was built of whinstone rubble and boulders from the beach. Now the group took to the stony beach and headed south. After rounding Balgowan Point they reached the caravan park at New England Bay. From here they headed west along a minor tarmac road going towards Port Logan. After a few hundred yards they turned north along Killumpha Drive. Dotted along here were a few small derelict buildings, remnants from the world war two airfield of Low Eldrig. At Drumhill a rockery ablaze with colour was admired. Across the road sitting atop fence posts were Bill and Ben the Flowerpot Men fashioned out of wood and flower pots. Reaching the B7065 another short stretch of tarmac north brought them to the track to Logan House Gardens. Passing palm trees and more Himalayan Balsam they soon reached the entrance to Logan Botanical Gardens. From here they made their way to the Potting Shed Bistro where lunch would be taken. Up until now the expected rain showers had failed to materialise and the group claimed three picnic tables overlooking the lily pond. With such delightful fare on the menu all the walkers purchased their food and drink from the bistro. In such beautiful surroundings lunch was taken at a leisurely pace. All good things must come to a finish though and reluctantly the group again took to the road. After retracing their way back to where they entered the gardens, they now took the track through the Curling Pond Plantation towards Logan Mains Farm. 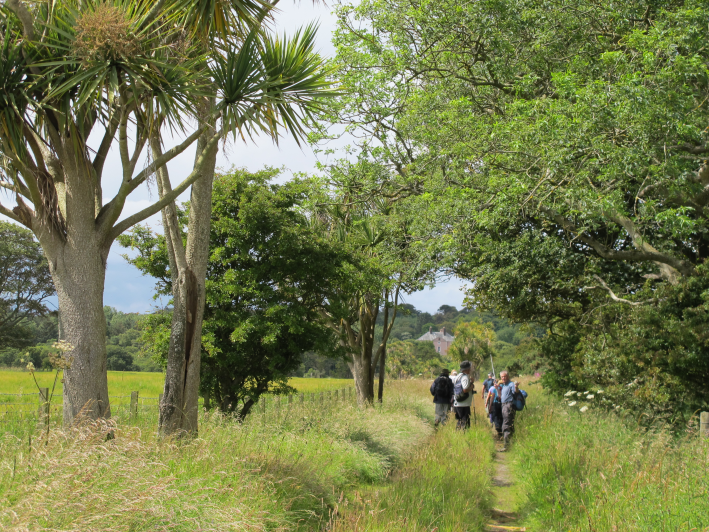 A row of empty old cottages was passed with one local rambler remembering them being occupied. 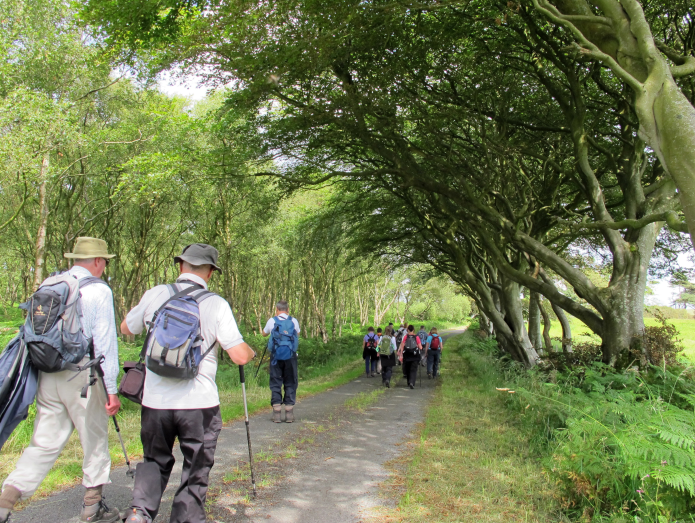 Passing a particularly wide beech tree, it took five ramblers with outstretched hands to encircle its girth. After reaching the farm the tarmac road back to the Drummore road was taken. Cows with young calves and a different view of Auchness Castle were seen along this stretch. 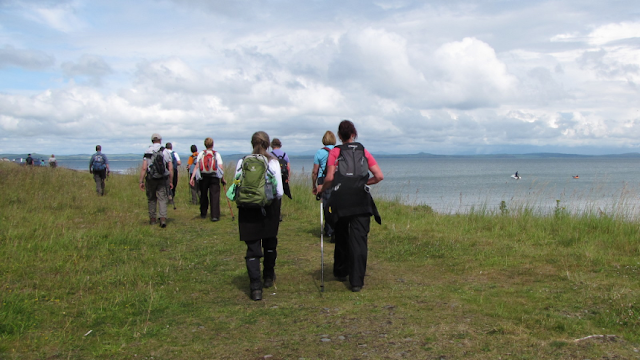 After reaching the main road they were soon back at a very busy Chapel Rossan Bay. Water sports enthusiasts were making the best of the still wonderful weather. 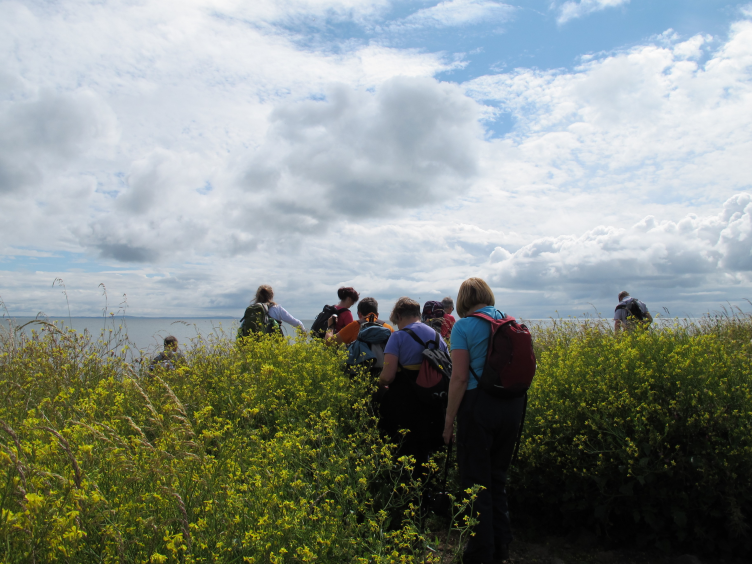 The sky, the sea, the wild flowers, lunch at Logan Gardens and the company made this a very enjoyable walk.